Gasp! Look at that old software! Really? We hear the story all of the time. 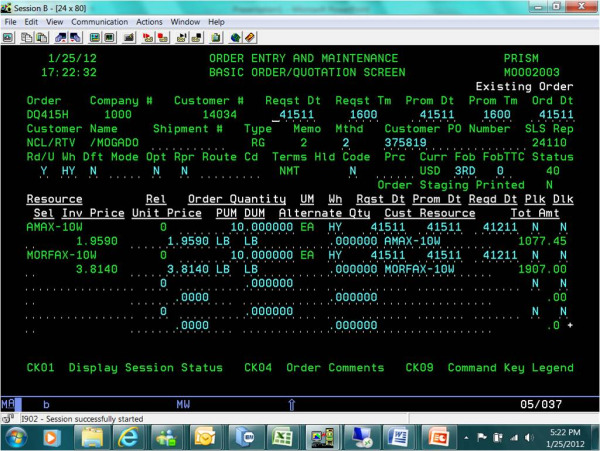 New executives and managers join a company, see the ERP's text-based green screens and immediately jump to the conclusion that the ERP system is not only old but can't possibly meet the company's current business requirements. Those that merely react and don't examine the facts are effectively "throwing the baby out with the bath water." Those that take the time to carefully analyze the situation quickly realize not only the comprehensive business functionality these legacy applications provide, but that they do satisfy the companies core ERP requirements. Some industry consultants even refer to legacy applications "as those that just work." In fact, most have been enhanced over the years to fit the company evolving requirements like a glove. The information entered into these systems and the enhancements to address changing business requirements is actually an extremely valuable company asset ... intellectual property. 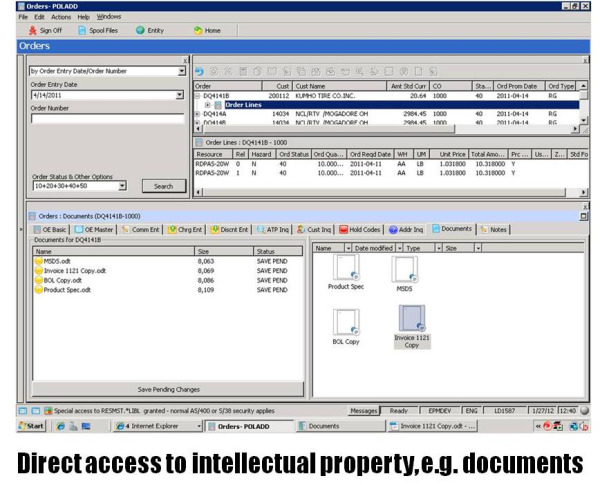 Over the years, more and more valuable intellectual property has been built into these enterprise business applications that you depend on. At the same time, there has been little new development in core ERP system functionality in the marketplace, even with the current Tier 1 suppliers. Too little has been done to core functionality that would justify complete replacement based on new and improved functionality. 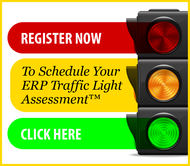 Replacing an ERP application requires a tremendous amount of resources, costs millions of dollars, and in the end provides similar core functionality as currently available in your legacy ERP application. Yet, the world and technology are moving at a very fast pace. Many employees entering the workplace today are accustomed to graphical screens on their hand held devices let alone their PCs. In-house applications need to talk with each other and to external systems, exchanging the valuable intellectual property built into them over time. One economically and strategically justifiable answer is to modernize the applications for a very fraction of the cost of replacement and delivering the ease of use and integratability of more modern systems. Modernization provides your organization with an application platform it can use well into the future, while concurrently maintaining a low total cost of ownership. Application modernization is a broad term covering many different interpretations, methodologies and implementations. The modernization approach you choose depends on your situation which will be driven by factors such as strategic business initiatives, application architecture, time, cost and available skills. Application modernization means taking an application built in the past and changing it to operate more appropriately for today’s business environment, addressing business opportunities. Comparing the characteristics of older systems and modern applications provides insight into what will change in the application during the modernization process. One of the most important aspects of application modernization is the ability to retain all of the intellectual property built into the applications over the years you've used them. At the same time, modernization provides an environment that can grow on employing the modern application architecture modernization puts in place. Application modernization is best accomplished with a tested roadmap for the project, such as that provided by PSGi. PSGi uses the native IBM modernization tools available on the IBM i along with tools from our partner, Lansa, to bring the most comprehensive set of modernization solutions possible to our customers. Application Assessment – The most effective modernization projects do not focus on entire applications but those areas where there is currently the most risk of issues and the most opportunity for improvement. Modernization Options – There are a variety of tools and methods available to modernize the application. The objective can be as simple as providing a new user interface over the web or as complicated as complete architecture replacement. The correct answer for a situation is usually in the middle of these extremes. It is important to match the solution to the problem using the most effective modernization tools available. Design and Planning - Identify options for application modernization based on a detailed analysis and discovery of the application software and how it is used in your business environment. Implementation – Develop the solution identified using the desired tool and strategies to most effectively bring the solution to your users. The modernization process retains the existing application and allows you to move components of the application into new environments, such as web-enabling the user interface or opening up parts of the application as a web service. A benefit of application modernization is keeping what is already in place, including the intellectual property. Your organization already knows how the existing application works and it already supports your specific business requirements. Modernization will improve the ROI on the ongoing investment being made in the application. 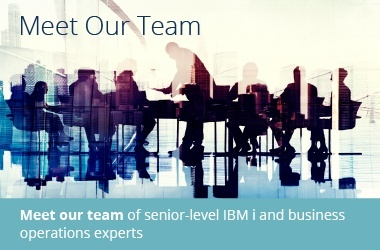 Using IBM tools and LANSA's application modernization products, PSGi can work with your team to modernize as much or as little of your legacy application as desired. Replace does not mean to replace an entire application, but rather to make available new applications that can replace current functionality. 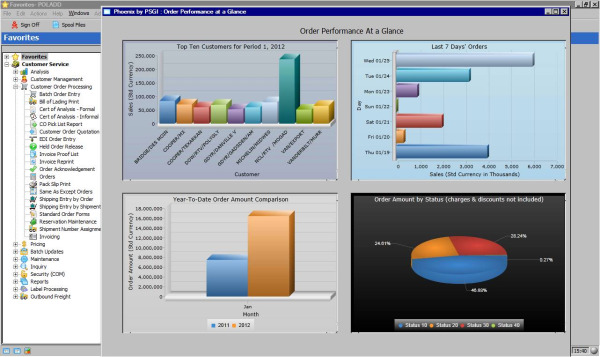 As an example, a user may have an inquiry to look at data which might bebetter viewed as a charts or a graph. Then a modernization task, a rich graphical-based application, can replace the inquiry and the user could still optionally drill down further into the data he would have seen originally. 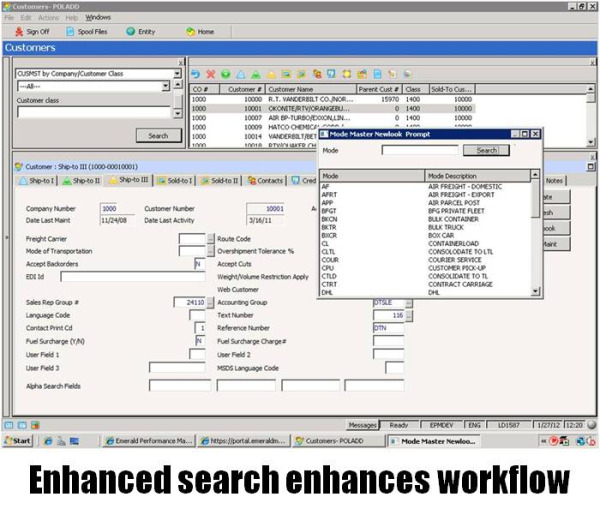 Fields modern graphical objects, such as tabbed cabinets, allow user to be directed to specific areas of the application, other internal applications or even areas external to the organization such as websites. Getting access to your applications via a browser or just an improved user interface is the most basic step in modernizing your applications. 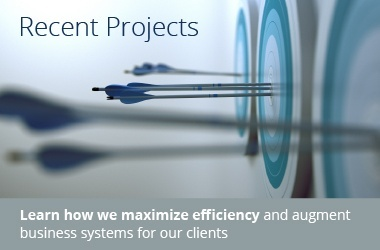 PSGi's expertise and tools can help achieve deployment goals quickly and efficiently. Providing a framework that can be applied across existing applications allowing future growth and ease of deployment of any application in your environment. 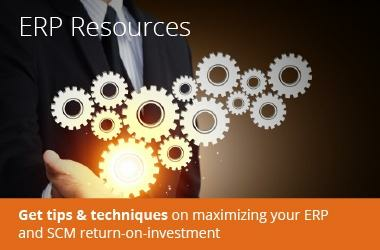 Organizations have made significant investments over the years in their current enterprise business applications. Most of these applications continue providing a substantial return on this continuing investment. While these investments are partially used to maintain these systems, a portion of the investment has been employed creating a wealth of company-specific intellectual property - a valuable company asset. 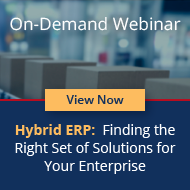 Modernizing functionally rich legacy ERP applications that "just work" is a cost-effective means of providing a contemporary graphical user interface, enhanced business workflow and simplified means of integrating systems on a broad scale. All of this while maintaining the intellectual property asset. And all of this at a fraction of the cost and pain of replacing these applications with applications of equal core ERP functionality.